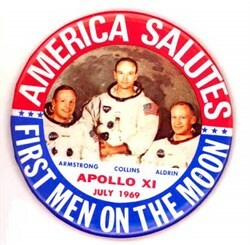 Historic original pinback button celebrating the Apollo XI moon landing. It measures 3 1/2" in diameter and shows a photo of the 3 astronauts, Armstrong, Collins & Aldrin, each with their name under their picture. In red print it reads, "Apollo XI, July 1969". Around the border it reads, "America Salutes First Men on the Moon". The button is in very good condition and is over 43 years old. The purpose of the Apollo 11 mission was to land men on the lunar surface and to return them safely to Earth. The crew was Neil A. Armstrong, commander; Michael Collins, Command Module pilot; and Edwin E. Aldrin Jr., Lunar Module pilot. After launch, the spacecraft was inserted into lunar orbit about 76 hours into the mission. After a rest period, Armstrong and Aldrin entered the Lunar Module preparing for descent to the lunar surface. The two spacecraft were undocked at about 100 hours, when the Command and Service Modules separated from the Lunar Module. The spacecraft landed in the Sea of Tranquillity at 4:18 p.m. EDT. Afterwards, they ate their first meal on the Moon and decided to begin the surface operations earlier than planned. A lunar module camera provided live television coverage of Armstrong setting foot on the lunar surface at 10:56 p.m. EDT. Just as he stepped off the lunar module Neil Armstrong proclaimed, "That's one small step for man, one giant leap for mankind." Aldrin emerged soon after, setting foot on the lunar surface at 11:16 p.m. EDT. Aldrin evaluated his ability to operate and move about and was able to move about rapidly and with confidence. Forty-seven pounds of lunar surface material were collected to be returned for analysis. The surface exploration was concluded in 2� hours, when the crew reentered the lunar module. After lunar ascent, the Lunar Module docked with the Command and Service Modules at 128 hours. The crew transferred into the Command and Service Modules, the ascent stage was jettisoned and they prepared for trans-Earth injection. Only one midcourse correction was required, and passive thermal control was used for most of trans-Earth coast. Bad weather made it necessary to move the splashdown point 346 kilometers (215 miles) downrange. Atmospheric entry phase was normal, and the command module landed in the Pacific Ocean at 195� hours. The landing coordinates, as determined from the onboard computer, were 13 degrees 30 minutes north latitude and -169 degrees 15 minutes east longitude. With the success of Apollo 11, the national objective to land men on the Moon and return them safely to Earth had been accomplished.